Herman C. Baumann was born in Oakland in 1890. His parents had moved to California the year before. After the 1906 Earthquake and Fire, downtown San Francisco was rebuilt with commercial buildings and apartment buildings. Many of these buildings still stand in the Lower Nob Hill Apartment Hotel District and the Uptown Tenderloin Historic District. The popularity of apartment buildings soon spread from downtown to the Western Addition and Pacific Heights, neighborhoods west of Van Ness Avenue which had survived the 1906 catastrophe largely intact. By 1910, Victorian residences in these neighborhoods had become costly to maintain, particularly large detached houses on corner lots. Many of these houses were first divided into apartments and subsequently demolished during the building boom of the 1920s to be replaced by apartment buildings. The new apartment buildings were typically six to ten stories. In Pacific Heights, they were luxurious. In some buildings, an apartment occupied an entire floor with views to all points of the compass. Some Victorian houses were spared, and the urbane mix of architectural periods and scale - Victorian houses and Art Deco apartments - creates a signature style for this section of Pacific Heights north of Lafayette Park. Baumann, who started his architectural practice in 1905 by specializing in apartment buildings, was well positioned for this change in taste and economics. 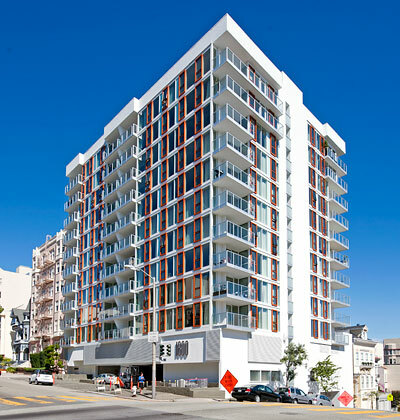 During a five year span he designed and built over five hundred apartment buildings, including two of his best known works, the Bellaire Tower and the Gaylord Hotel (San Francisco Landmark 159). 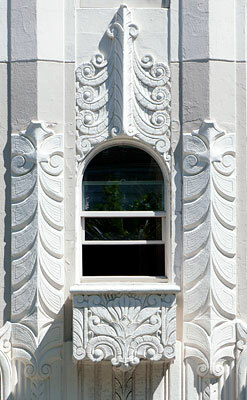 Baumann also designed hotels and commercial buildings in San Francisco, Oakland, and Sacramento. During World War II he designed many structures for the Navy at Mare Island and other locations. After the war he designed about a dozen multi-family housing projects in the Bay Area. Herman Baumann died a week before his 70th birthday on April 6, 1960. 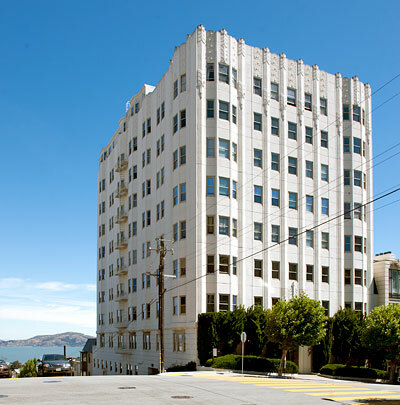 The apartment building at 1800 Pacific Avenue was Baumann's last completed building, an attempt at the International Style which would be at home in Fort Lauderdale or Miami Beach but in Pacific Heights looks like a party crasher dressed by Donatella Versace. The Talbot-Dutton House in the lower photograph is San Francisco Landmark 57.